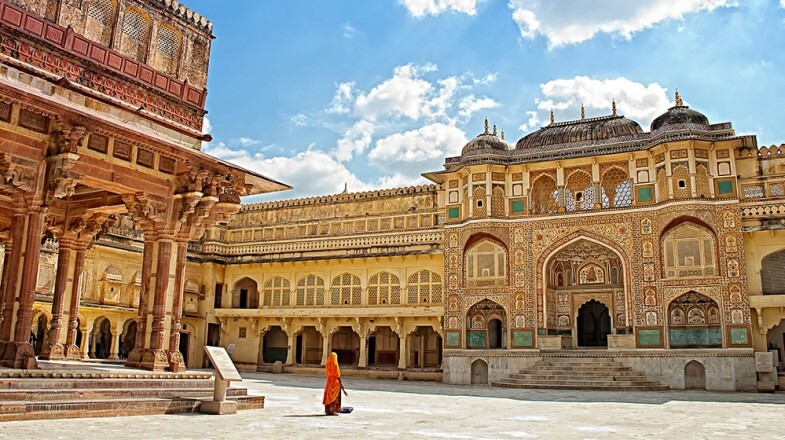 India is full of cities with beautiful architecture and history and Jaipur is definitely one of those hidden gems. You'll find many palaces, forts, and religious temples all with their own unique charm and design. While Jaipur isn't on the top travel lists for India destinations, it definitely has a lot to see for travelers looking for an adventure. Built around 400 years ago, this beautiful palace stands tall and proud on a cliff overlooking the region and can be seen far and wide. The palace is packed full of jeweled beauty and a bit of secrecy with hidden passageways around every corner. You can reach the Amer Fort uniquely on the back of an elephant and be dropped at the central courtyard on your visit. Right in the middle of the Old City you'll find the City Palace which is a huge complex of ornate gates, buildings, gardens, and courtyards. You can tour the area and you'll find plenty of incredible places for photo taking, especially the Hawa Mahal with its 953 windows. There's also a bazaar just nearby which is famous for local spices and souvenir shopping. Jaipur is an absolutely beautiful city, but it is riled with pollution and homelessness. When tourists visit, they can often be overwhelmed with this at times and be driven away from the city. That's why it's important to know ahead of time that you will encounter this, but despite this it is still a very safe city to be in. Haggling for prices will be a must when you're in Jaipur no matter where you go. From tour groups, to food, to shopping centers, taxi rides and even at your hotel. If you have a local to join you, it will be a much simpler experience otherwise be ready to haggle for every price you pay.